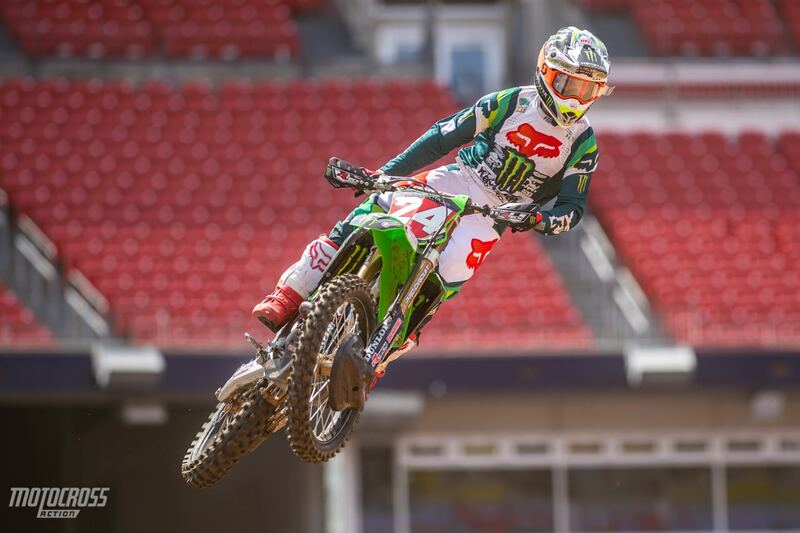 Eli Tomac is back on top in Nashville! 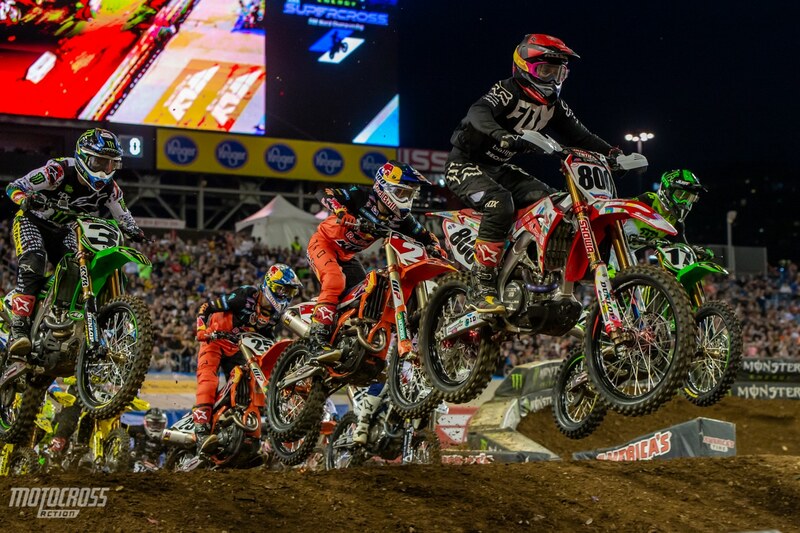 Ken Roczen crashes, Marvin Musquin crashes, Eli Tomac comes from behind, Blake Baggett crushes the whoops and Cooper Webb salvages a rough day and lands another podium finish. 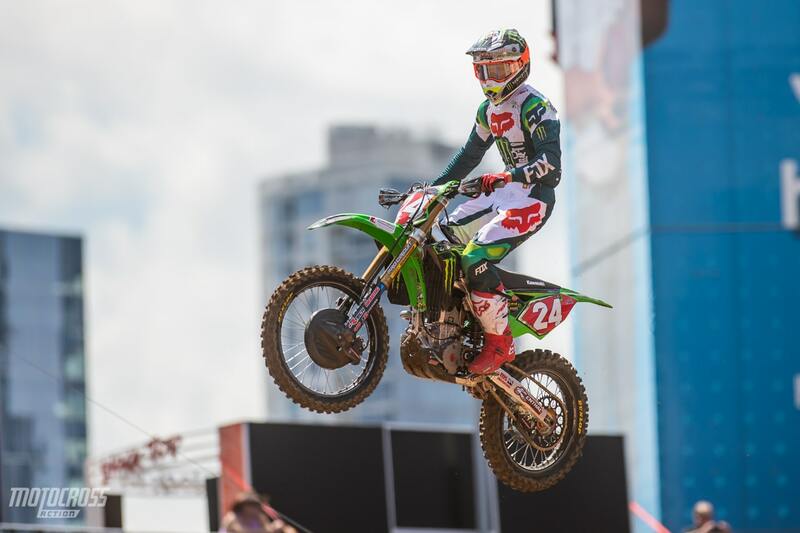 After dominating the first six rounds of the 250 East Championship, Austin Forkner crashed in the whoops during qualifying, suffered a knee injury an sat out the races in Tennessee. 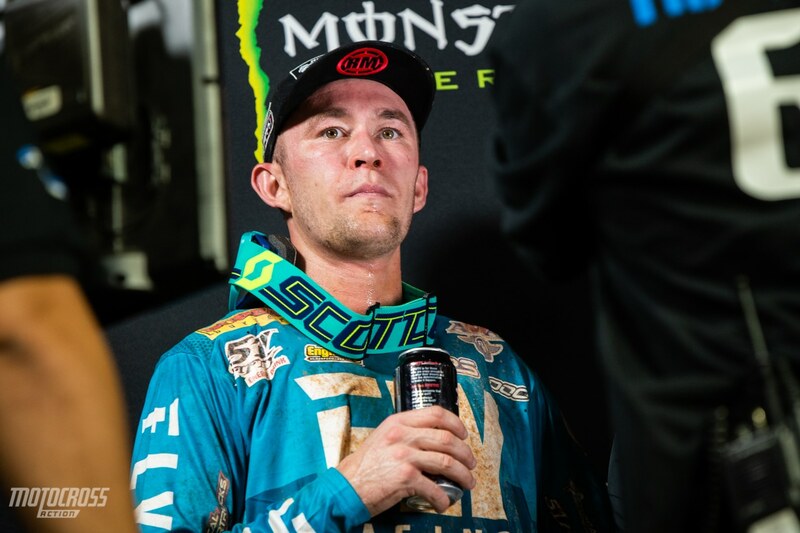 Luckily Austin had a 26-point lead coming into Nashville which happens to be the same amount a rider earns when they finish first in a main event. Chase Sexton currently sits second in the series and he finished second in Nashville which earned him 23 points. That means that even after missing the race entirely, Austin still remains the points leader by 3. 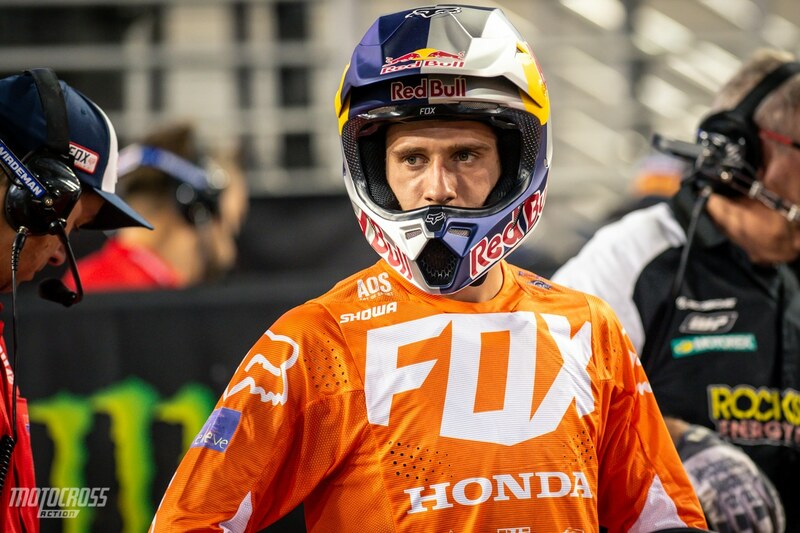 Once again Ken Roczen was denied a victory. It wasn’t his fault, but when Joey Savagty crashed Ken had nowhere to go. Unfortunately this crash would take Joey Savagty out of the race and knock Ken Roczen back to 21st place. 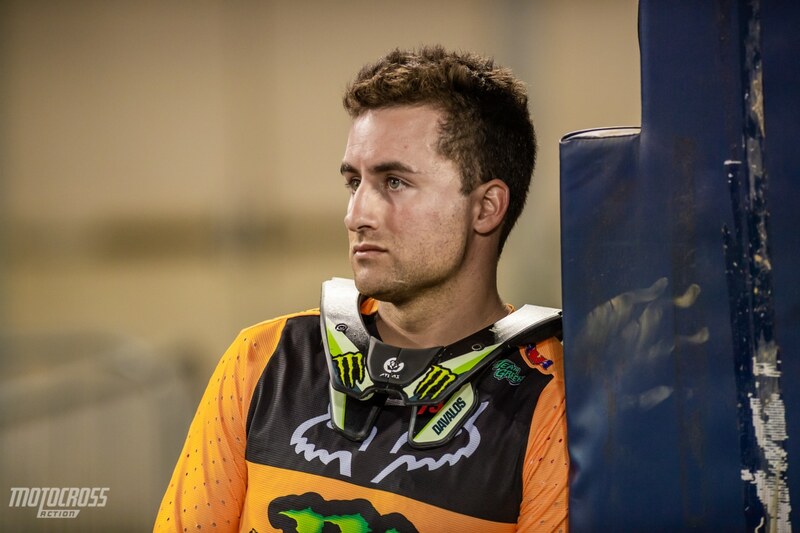 Martin Davalos: “It’s been a tough offseason obviously. Breaking my neck last year and ACL/MCL reconstruction. I’m trying to come back and obviously I didn’t think my neck was going to be an issue coming into this season. My ACL in my knee feels great, but the more I started riding the more my arm was going numb. My wrist was locking up and it was pumping up. It was a terrible, terrible feeling. 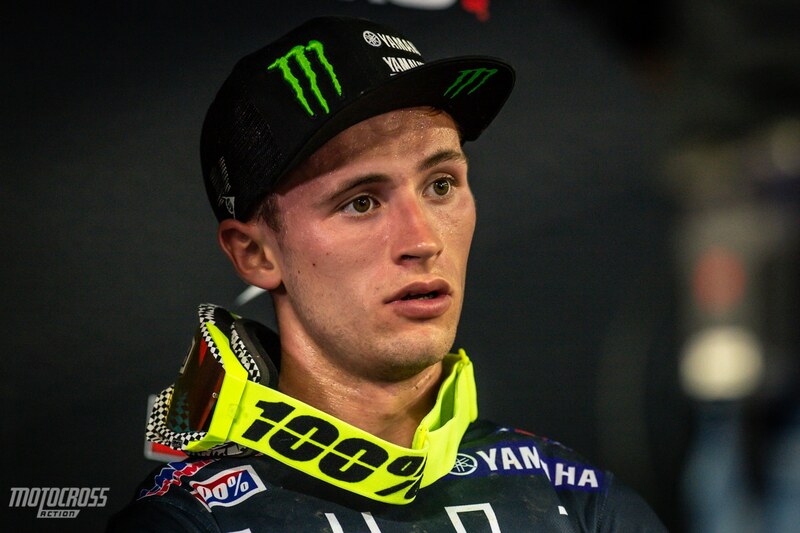 When you’re riding against the best in the world and you prepare so well and you cannot deliver and you can’t ride to your full potential, it’s just frustrating. I talked to Mitch after Daytona and I needed to do something about it. I went to see a lot of doctors in California and they found out that I have brachial plexus edema on my neck. So they put me under last Friday to try to calm my neck down a little bit, it’s just a mess in there. I haven’t ridden Supercross since Indianapolis, I rode a little bit of outdoors to do some testing but I’ve just been trying to calm it down a little bit. It’s gotten little better, but last night I woke up with a lot of pain on my arm and my trap is completely locked up and my hand just feels like it’s burning. So it’s been a tough go for me. Tonight felt great. The guys made a little mistake and I took advantage of it, I put myself in the right position and rode smooth. Chase Sexton shares his point of view about Justin Cooper taking him out: “I got a pretty good start, I had a really good gate and I really felt like tonight was my night. I just made a quick pass on Justin and I was honestly just trying to go and sprint away. I knew it was going to be a gnarly track. I kind of clipped the rhythm along the bleachers and he got inside of me and I don’t really have much to say about it. It was a bummer that we both went down, especially on the first lap, it put us all the way back. But I came back to second so I can’t ask for much more. I was just trying to put my head down. Martin was riding good, he was just a little too far out there. I’m happy to make up points, it was a bummer that Austin wasn’t racing. That’s not how I want to make up points but you gotta be there every weekend. I’m just trying to put my head down and man I’m over sitting in this second place spot. I’m just trying to make more progress and come out swinging in Metlife and this time just make it happen. 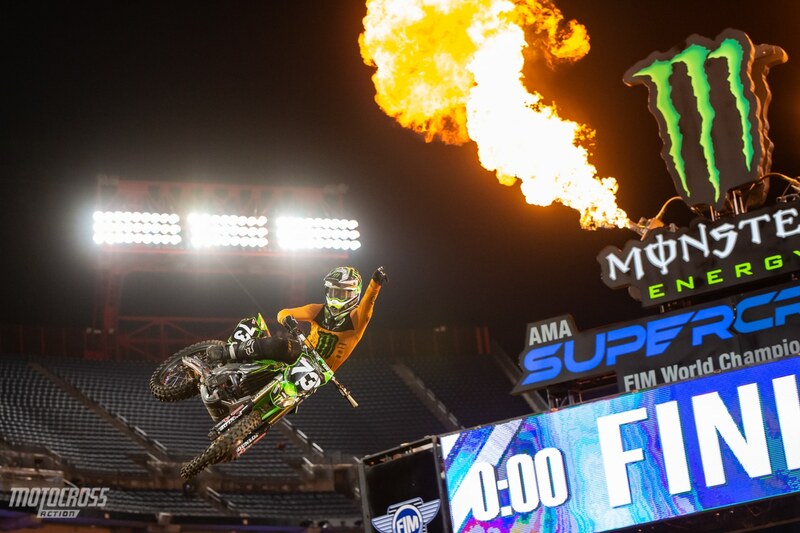 Eli Tomac whips passed the massive fireball as he wins his fourth race of the season at the first ever Nashville Supercross. 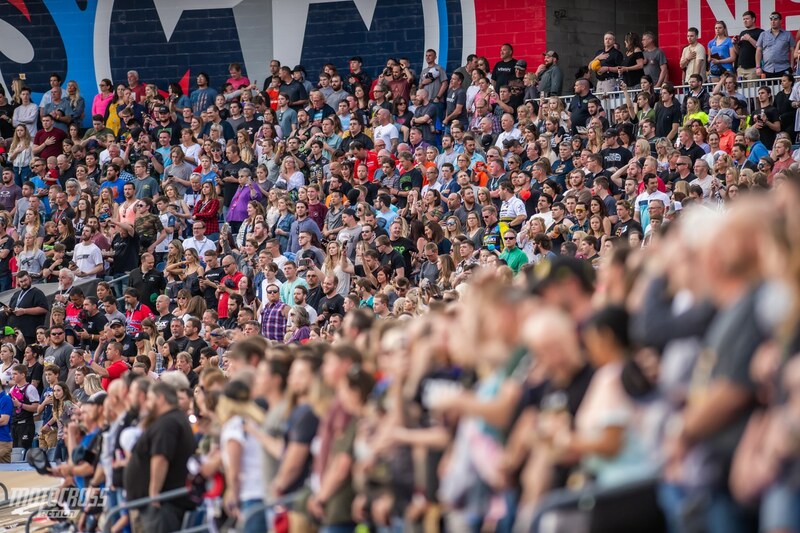 Lots of fans showed up to the Tennessee Titans Nissan Stadium. 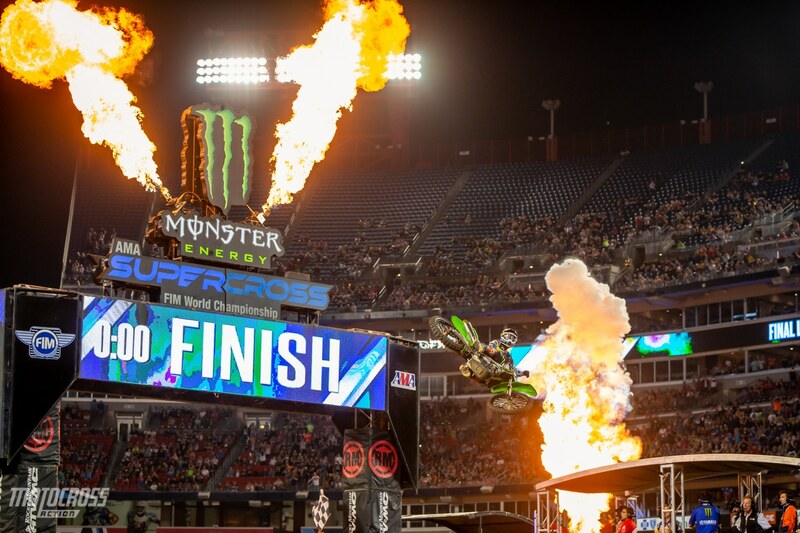 This was the first time ever that the Supercross series has stopped in Tennessee and the Nashville crowd proved to FELD that they made a good choice by adding Tennessee to the schedule. 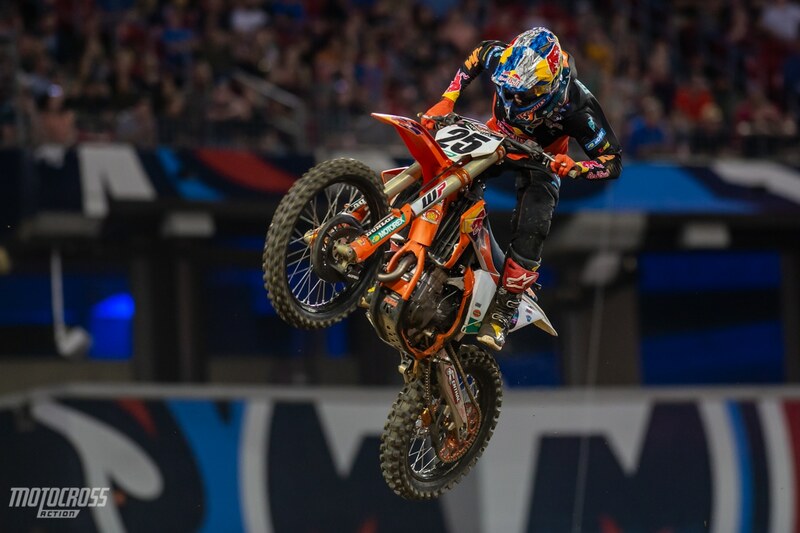 Ryan Dungey was out on the track to get the Nashville fans excited during opening ceremonies. 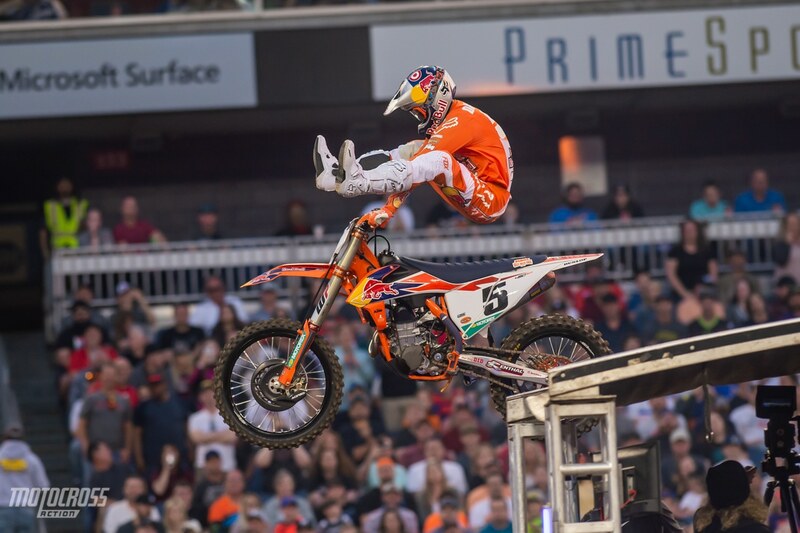 His heel-clicker was impressive, but you can tell he doesn’t have the flexibility that his friend Marvin Musquin has. 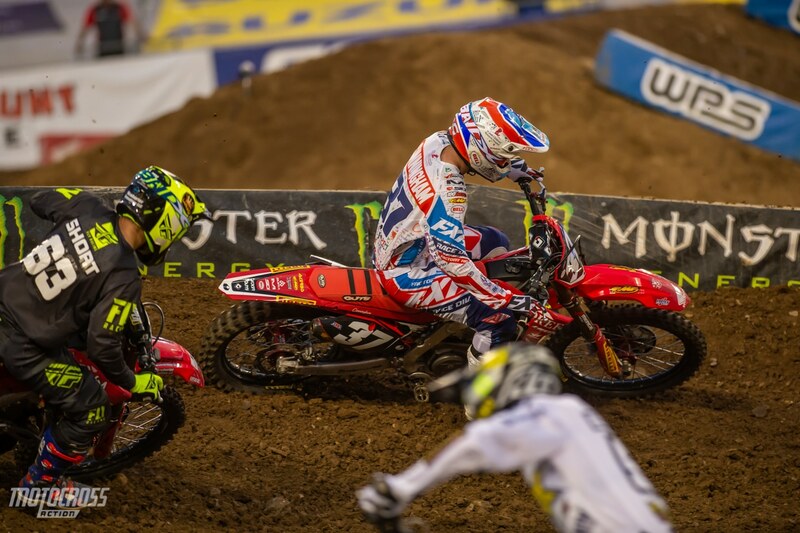 Ken Roczen’s string of bad luck continued in Nashville. He had a stellar day going, he qualified first, won his heat race and he was looking good while running third in the main event. Unfortunately for Ken, on lap three he was closing in on Joey Savagty for second place when Joey crashed going into a corner and Ken ran right into him. Ken fell over and berm and lost valuable time on the leaders. He got up in 21st place and he charged through the pack to finish 8th. Another round is complete and once again Cooper Webb makes his way onto the podium. 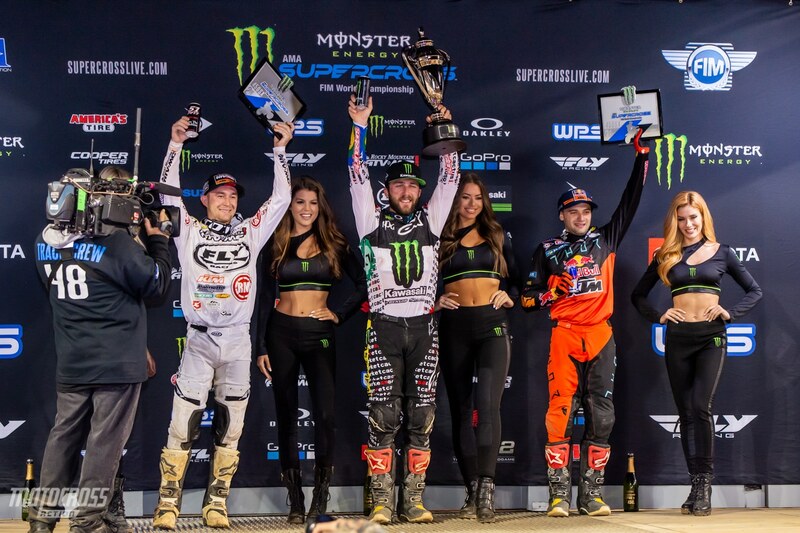 Nashville was Cooper’s 10th podium of the year and even though he didn’t win, he extended his points lead over second place. After Nashville, Cooper Webb holds a 21-point lead over Eli Tomac and Marvin Musquin who are now tied for second in the standings. 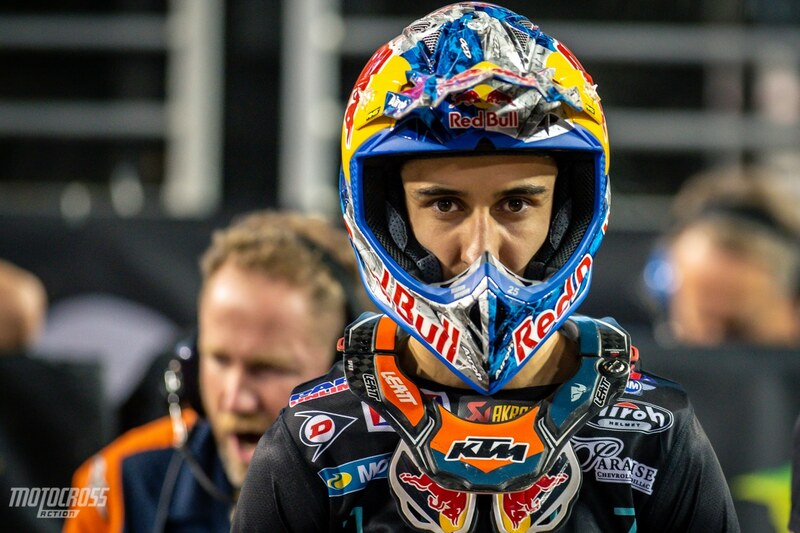 Marvin Musquin went down while running in second place behind early on in the main event. He was right behind his teammate Cooper Webb before he crashed. Unfortunately it took Marvin a while to get up. He remounted in 20th place and charged his way up to 6th by the time the checkered flag flew. 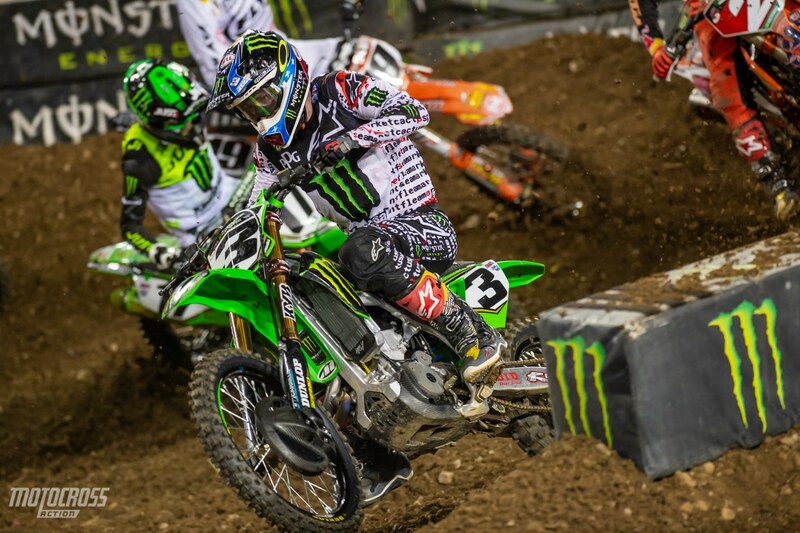 Eli Tomac had the mechanical issue with his bike while leading the heat race that caused him to DNF. He then had to go through the LCQ to qualify for the main. When asked if the bike issue effected his confidence afterwards, Eli admitted that it was hard, but he had to trust his team and his mechanic. 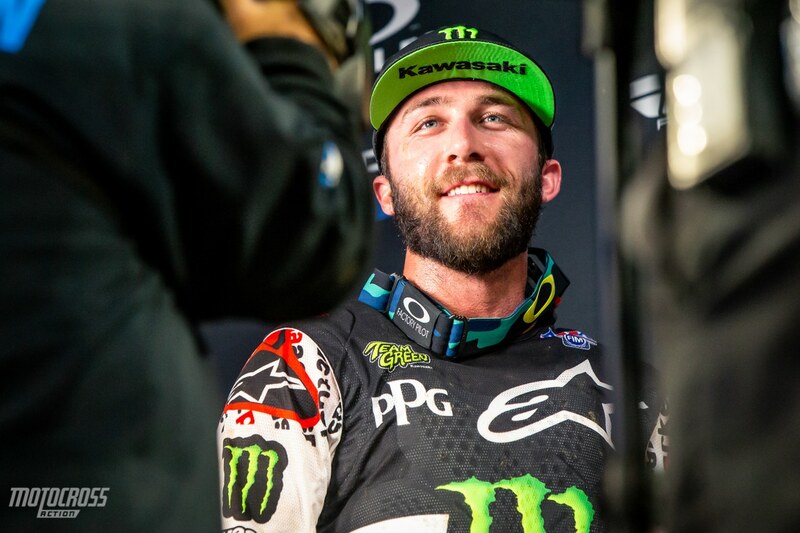 He trusted that they had it fixed and he said that he didn’t feel anything wrong with it when he was riding, Eli’s KX450 was still smoking just slightly after winning the main event too. Cooper Webb had a rough start to his day in Nashville. 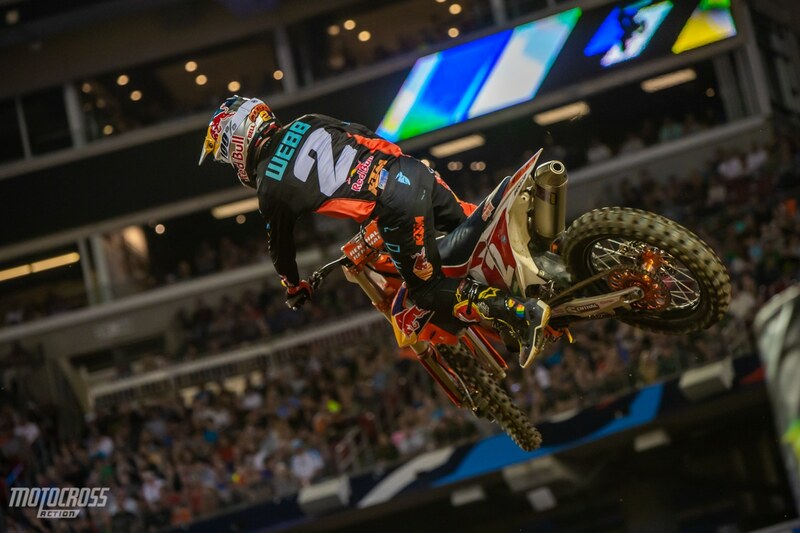 He qualified 10th, over a second behind Ken Roczen. And then early in the first heat race, shortly after this photo was taken, Mike Alessi landed on him and knocked him down. 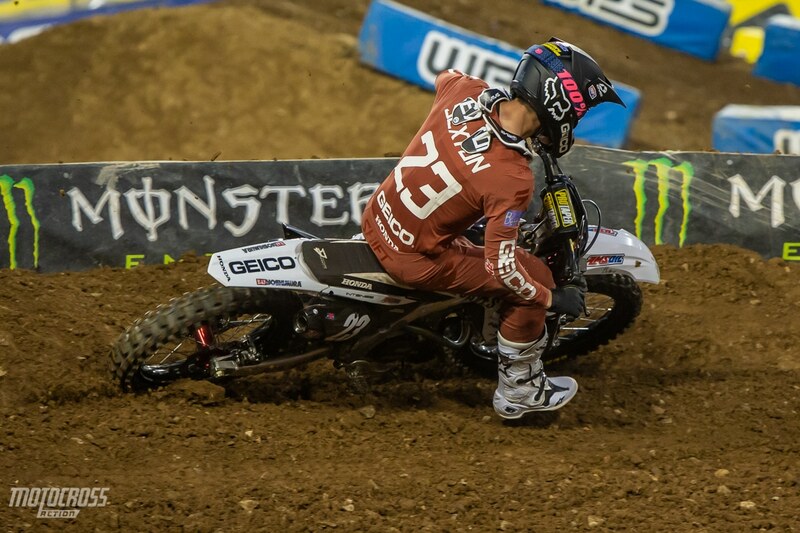 In Mike Alessi’s defense it wasn’t really his fault. Mike was already in the air when Cooper decided to turn right and Cooper ended up right where Mike was landing. Luckily for Cooper Webb, he wasn’t injured and he was able to get up and continue the race. Shortly after, two other riders went down hard and the race was red flagged and restarted. 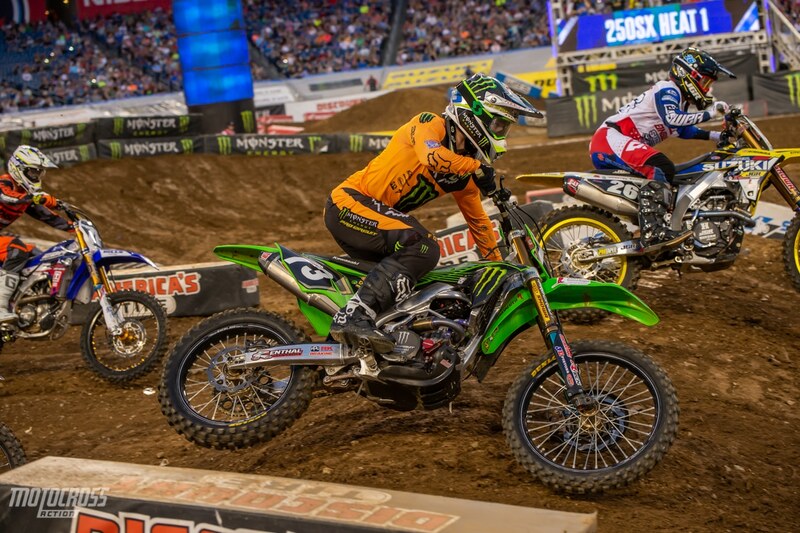 Joey Savatgy looked great in Tennessee, he qualified 4th and finished 2nd in his heat race. Unfortunately the Monster Energy Kawasaki rider lost his front end coming into a corner and crashed. 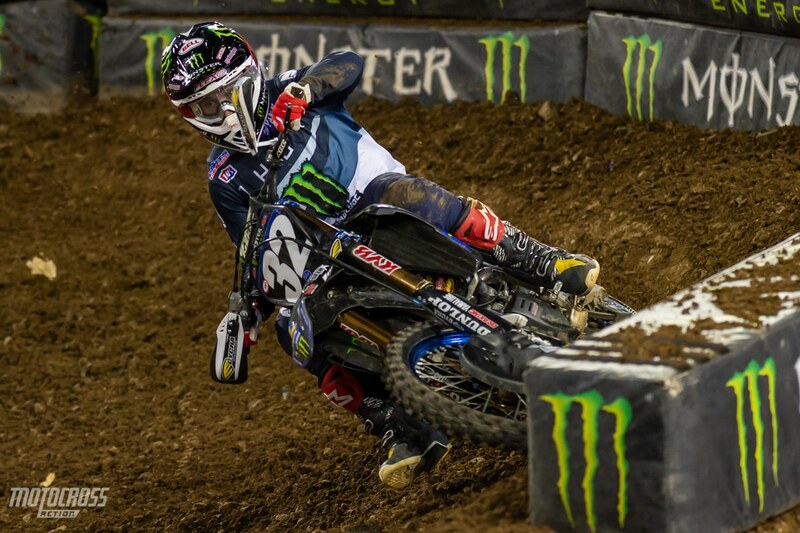 The dirt in Nashville was very slick and Joey leaned too far coming into the berm and low-sided his bike. He walked off the track slowly, favoring his shoulder and wrist. 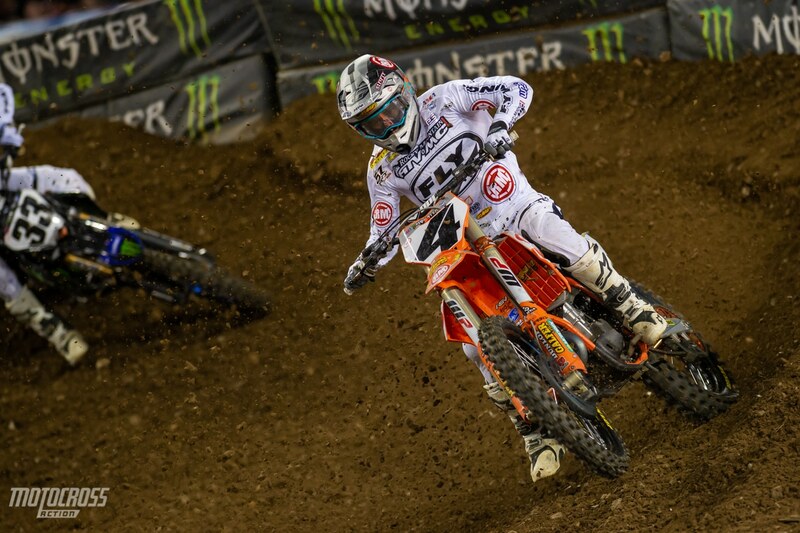 After a 2nd place in Indianapolis, Blake Baggett’s finishes have been 7th and 8th at the last two rounds. 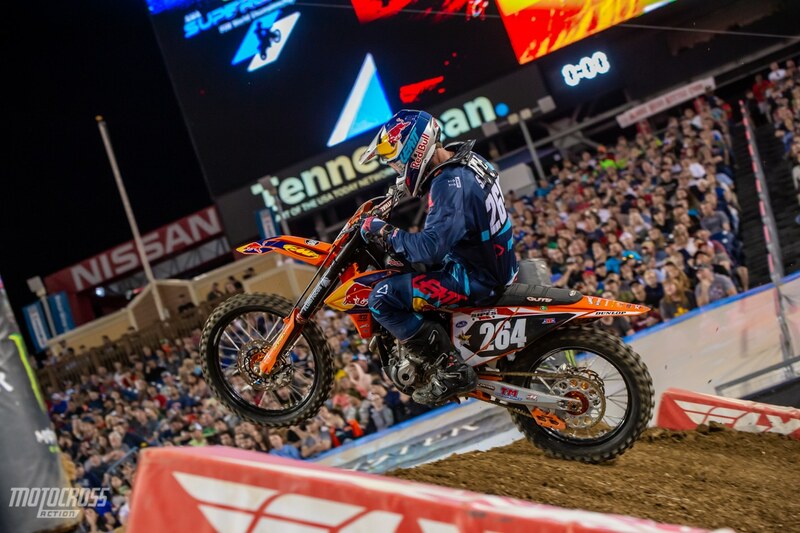 The Rocky Mountain KTM rider turned it up a notch in Nashville though. He was running in 5th on the first lap and he passed his way up to 2nd by the end of the race. 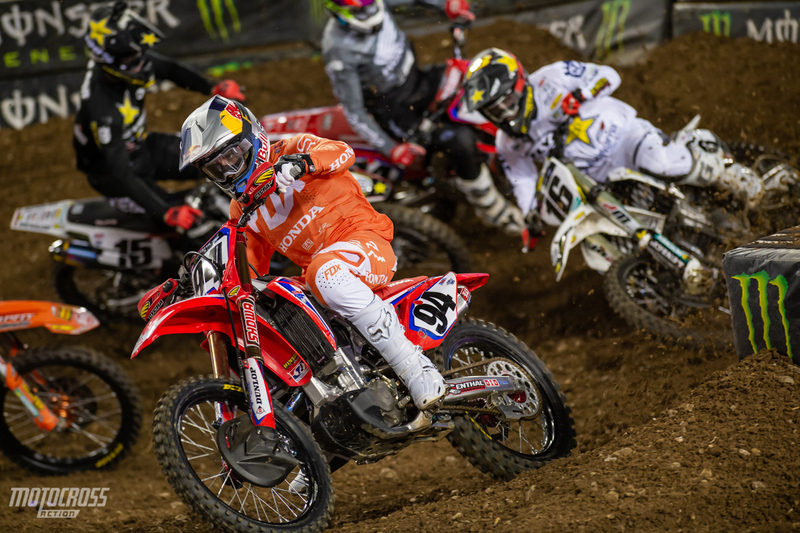 Another rough night for Marvin Musquin caused him to lose four more points on his teammate Cooper Webb in the Championship. 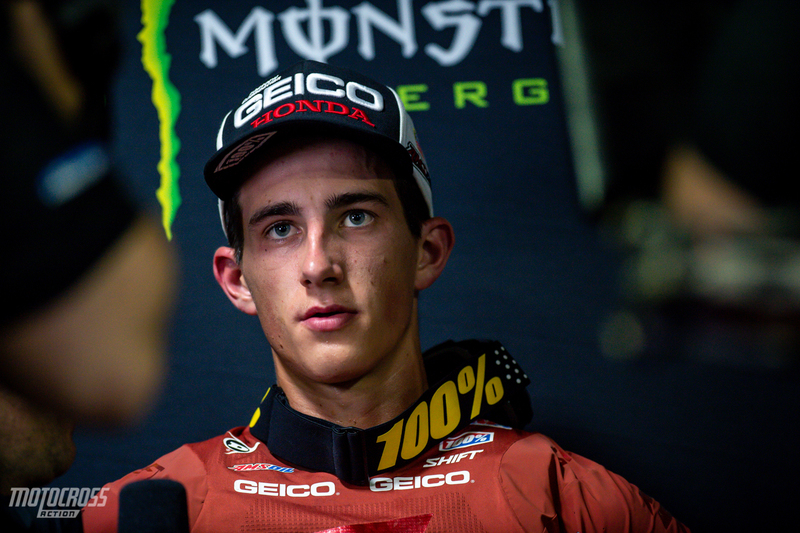 Now, 21-points behind with three rounds left, it’s going to take a big mistake from Webb for Marvin Musquin or Eli Tomac to be able to win the title. Ronnie Stewart and Tyler Enticknap crashed hard together in first 450 Heat race of the night. So far we know that Ronnie was knocked unconscious in the crash and originally he had some loss of memory. But we’re glad to hear that he has regained his memory since then. He also has some bruising in his lung and upper body. Tyler Enticknap announced on Instagram that he injured his L-5 in his back and broke his sacrum. We wish both of these two all the best in their recovery! Zach Osborne scored a 5th place finish at round fourteen. So far this is Zach’s best finish in his rookie 450 season. 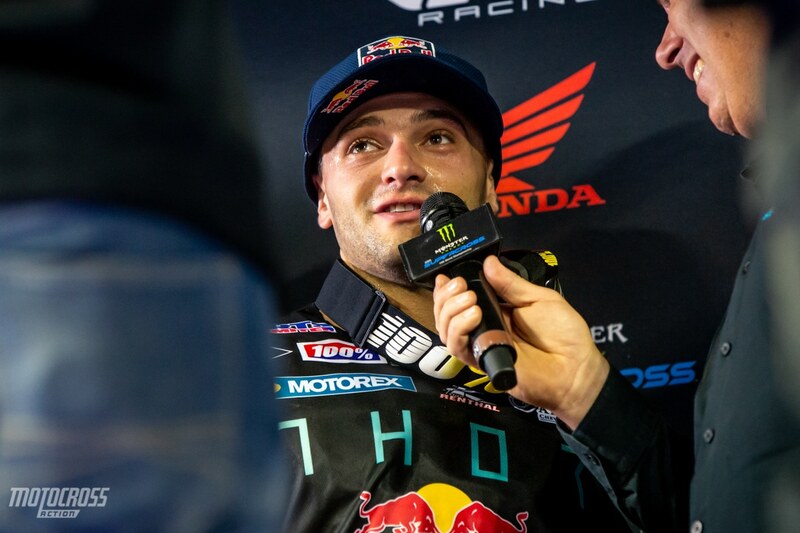 After a rough 2018 year, Martin Davalos wins his first race of the season in Nashville. 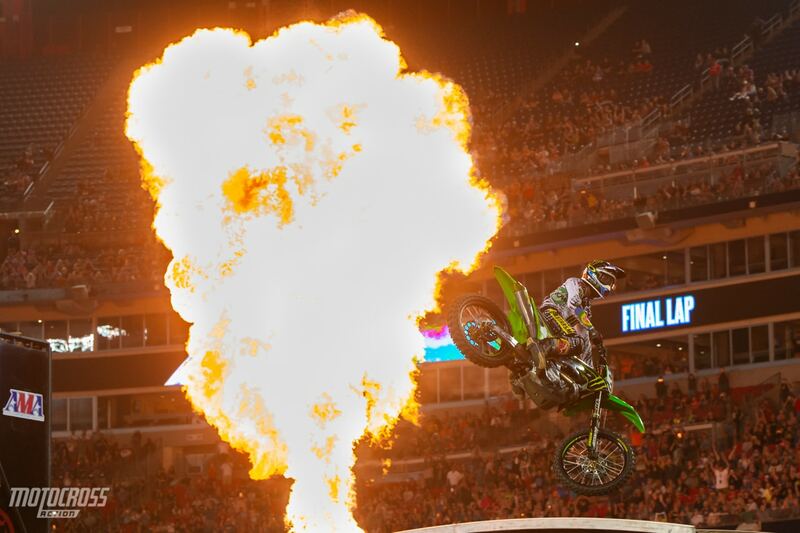 He also continues the win streak in the 250 East Coast Championship for the Monster Energy Pro Circuit Kawasaki team. 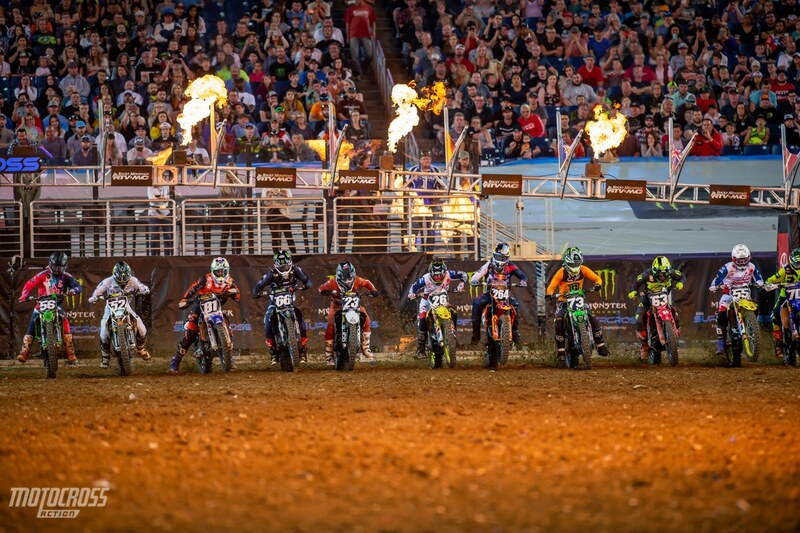 The 250 East Coast class lights the fireworks as the gate drops for the first ever Supercross Main Event ever in Tennessee. 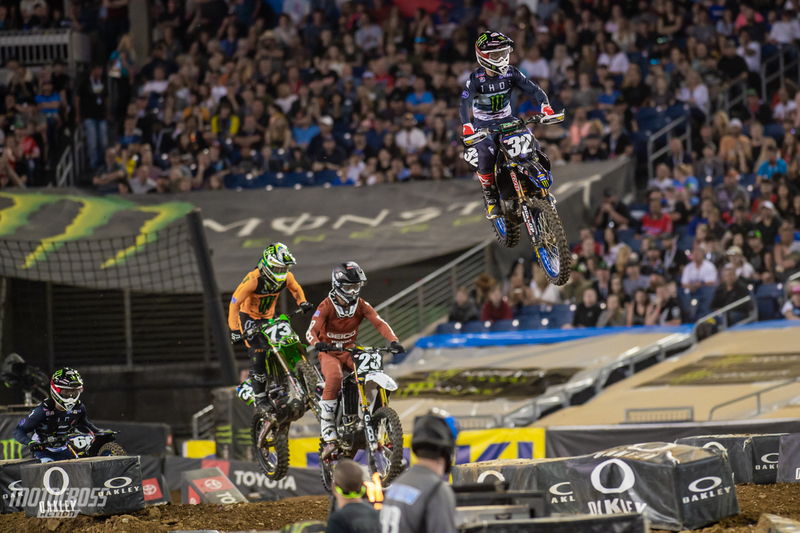 Justin Cooper (outside of the picture frame) would grab the holeshot from the far outside with Chase Sexton and Mitchell Oldenburg right behind him. Justin Cooper leads Chase Sexton, Mitchell Oldenburg, Martin Davalos and the rest of the pack early in the 250 main event. Shortly after this Chase Sexton would put some pressure on Justin Cooper and make a pass for the lead. Then just two corners later Justin Cooper attempted to block pass Sexton and get back into the lead, but unfortunately he took himself and Chase Sexton out in the process. Chase Sexton looked like he would be the guy to beat in the 250 class after Austin Forkner was injured. He qualified fastest, won his heat race and was leading the main event before he got taken out. 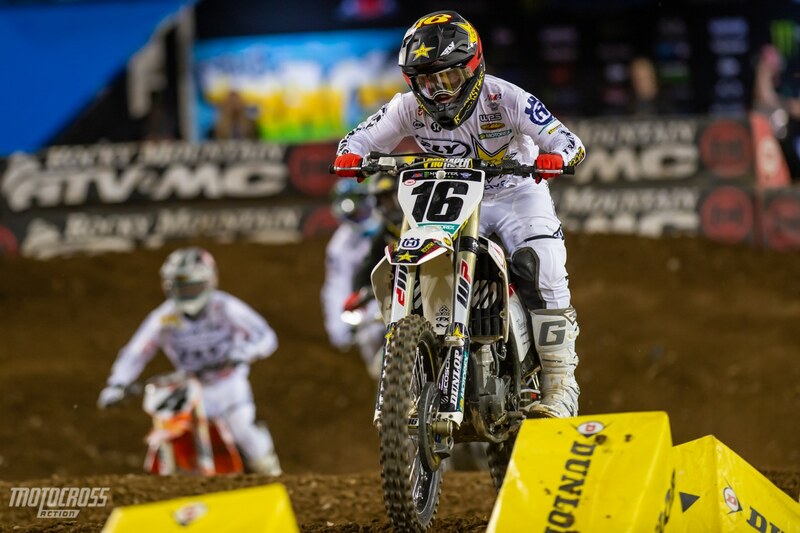 After picking his bike up, Sexton crossed the finish line in 16th on the first lap. 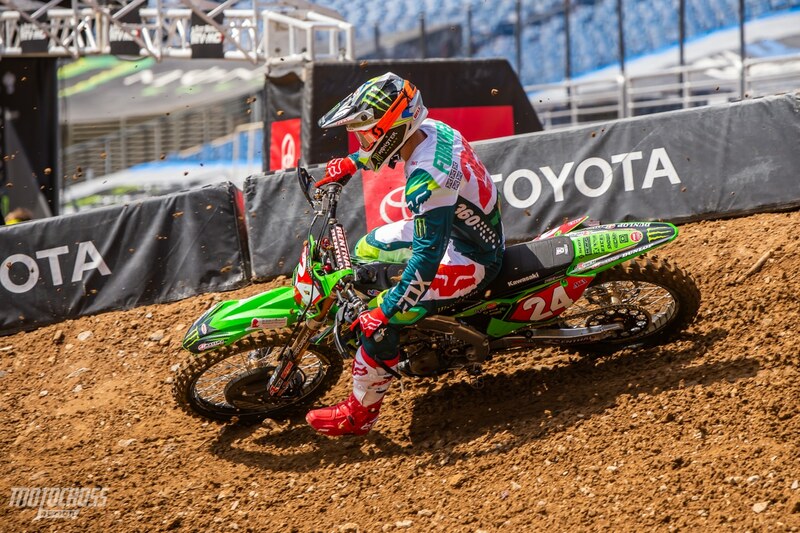 He put his head down though and charged all the way through the pack to finish 2nd and close up to be only 3 points behind Austin Forkner in the 250 East Championship. 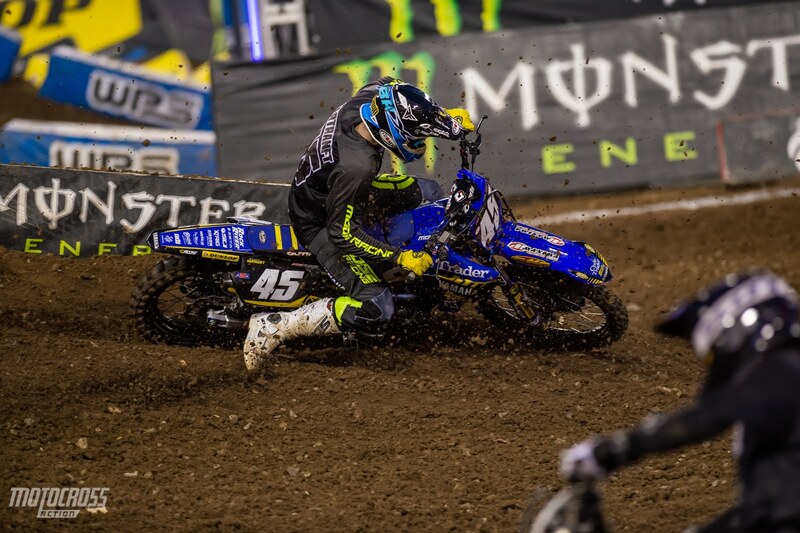 Justin Cooper was riding with high intensity early in the 250 main event. 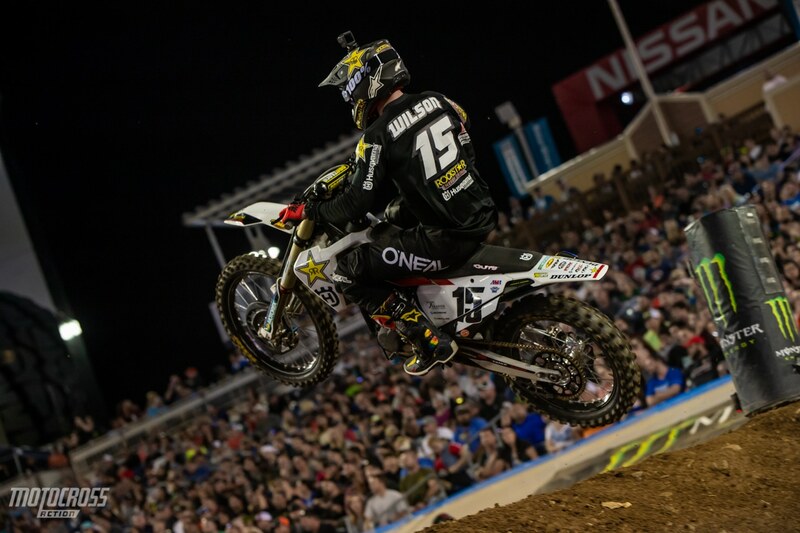 He admitted that he wasn’t trying to take himself and Chase Sexton out, but that he was excited and trying to capitalize on the night with the current points leader not in the race. 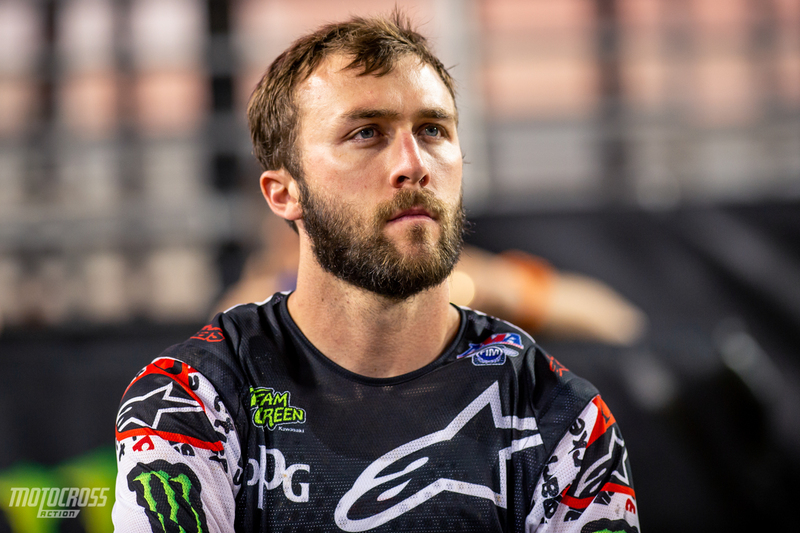 Justin Cooper would crash a second time while fighting his way through the pack, but he still managed to catch up and place third. Kyle Peters had a good run going in Nashville. With many of the top riders missing at the front of the pack early in the main event, Kyle Peters, Brandon Hartranft, Mitchell Falk and more were able to show their skills at the front of the pack. 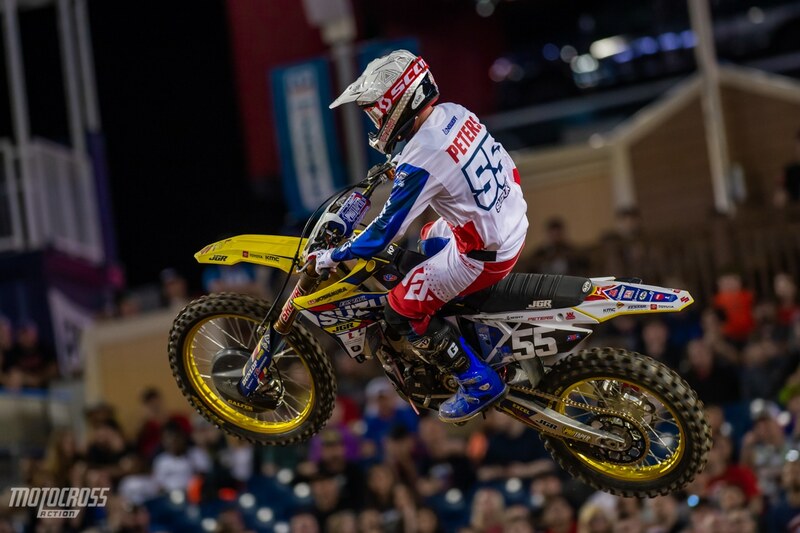 Kyle Peters held a podium spot for most of the race, but Justin Cooper was able to get around him with three laps to go and he finished 4th. 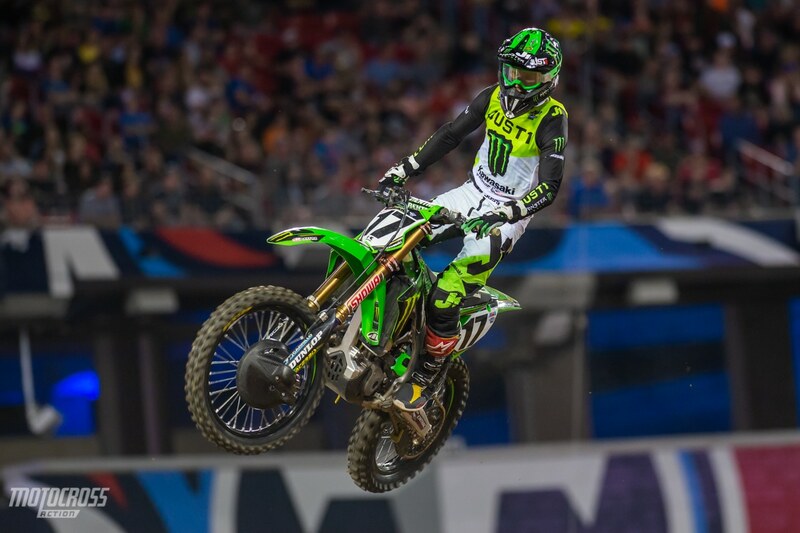 Even though Austin Forkner didn’t race, he still maintained the points lead. Although now his knee is hurt and it has shrunk to only 3 points. Only time will tell if Austin will be able to race the final two rounds and contest for the title. 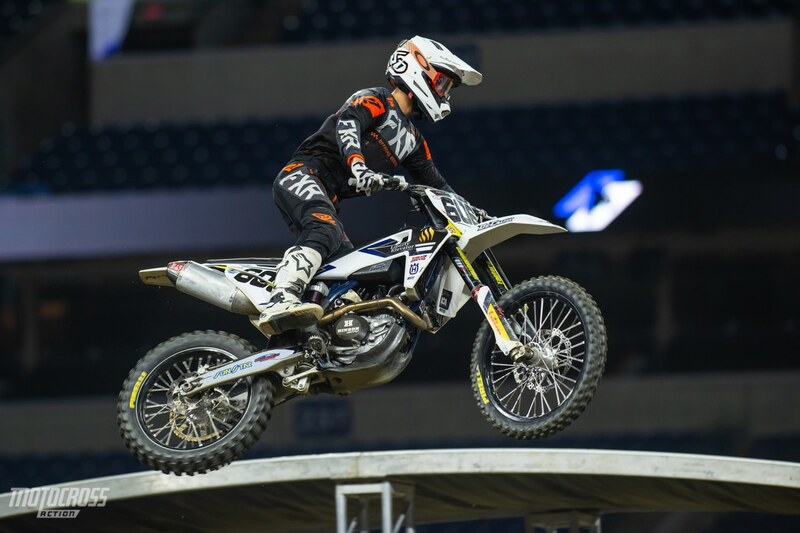 Mitchell Oldenburg had a great opportunity for a podium in Nashville, but sliding out on the first lap would cause him to drop back. Mitchell picked his bike up and came back to finish 6th. Mitchell Falk has had a rough go thus far in his rookie Supercross season, but he showed serious potential on Saturday in Nashville. He ran up front in both of his races and finished 5th in the heat and 9th in the main event. R Brandon Hartranft continues to impress on his Cycle Trader Rock River Yamaha. After running up front in the main event, he would drop back to finish a career best 5th place. 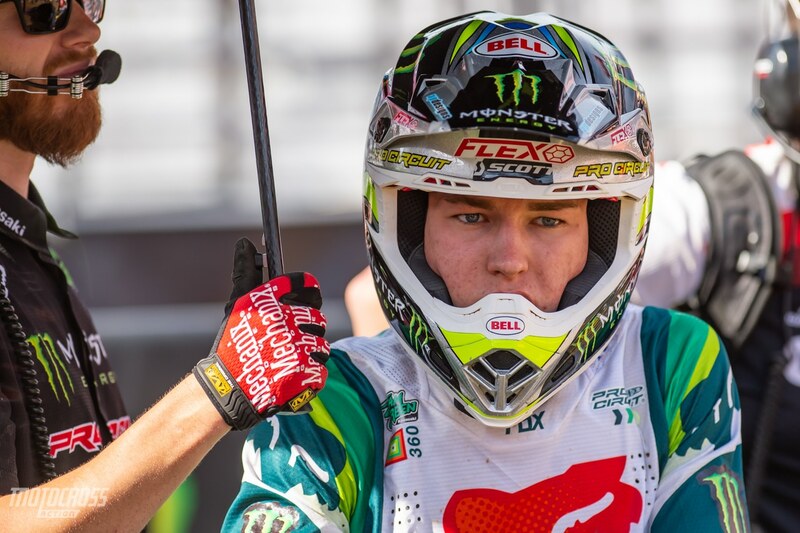 Austin Forkner has had his fair share of crashes during practice and qualifying this year, but he’s always been able to put it together in the main event when it matters most. Finally his luck ran out. 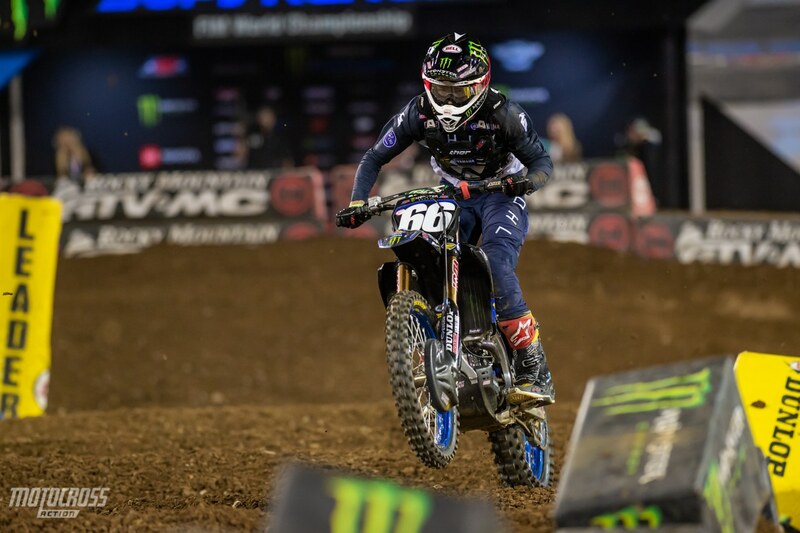 We hope that Austin will heal up quickly and be back racing at the next 250 East Coast round in three weeks at the East Rutherford Supercross. Kyle Cunningham finished 7th place for the third time this season. 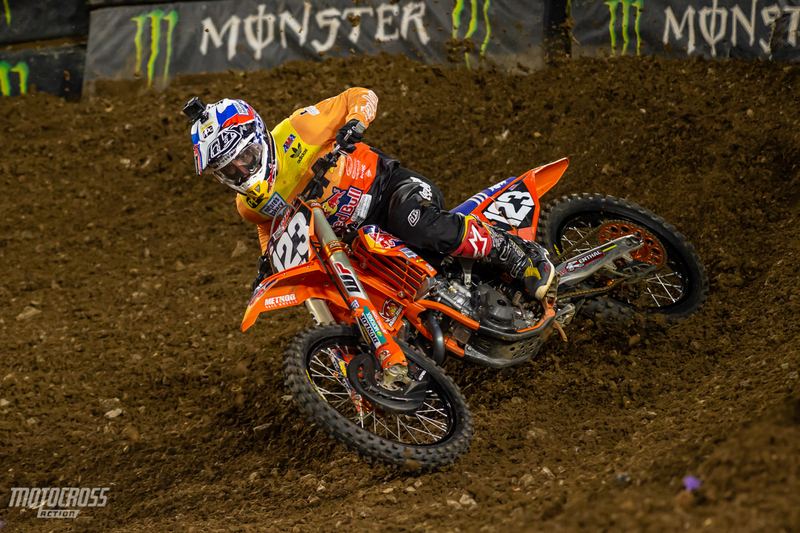 Ryan Sipes finished an impressive 8th place in his second Supercross race of the year.